Make this delicious dessert in the summer with fresh peaches and blueberries, or any other time of the year with frozen fruit. This time of year, when our local supermarket has a buy one-get one special on fresh, local blueberries we always stock up. And – when the supermarket ALSO has fresh summer peaches on sale – well, there’s no better time to make this fantastic Blueberry Peach Cobbler. 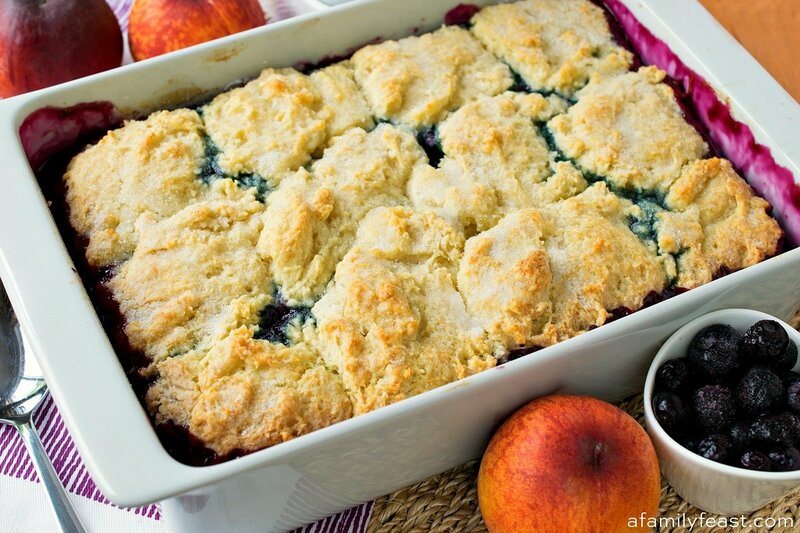 Our Blueberry Peach Cobbler is really wonderful! The silky blueberry peach filling is sweet – but not too sweet – and the blueberry and peach flavors really shine through. We also include a little bit of fresh lemon juice and lemon zest to the fruit mixture, adding a bright, fresh citrus note that really complements the blueberries and peaches. Then, a sweet buttermilk cobbler topping is spooned in dollops over the filling. After a final sprinkle of some extra sugar on top, the Blueberry Peach Cobbler is baked in the oven until lightly golden brown on top and hot and bubbly underneath. As soon as the Blueberry Peach Cobbler comes out of the oven, we brush the top with some melted butter (because everything is better with a little more butter!) and allow the cobbler to sit for about five minutes to set up a bit. We always serve our Blueberry Peach Cobbler with some vanilla ice cream. The heat from the warm-from-the-oven cobbler melts the ice cream a bit – and each bite is a little bit of summertime heaven! In a large bowl, place peach slices and blueberries (if using frozen,no need to thaw). Add sugar, zest, juice and corn starch and toss to coat. Pour into a 9×13-inch pan with sides at least 2 ½ inches high. Place in oven and bake 25 minutes. Remove from oven and cool 20 minutes. Mix flour, baking powder, baking soda, 1 tablespoon of sugar and salt in a large bowl. Place buttermilk and 8 tablespoons of melted butter in bowl and whisk. Add the buttermilk mixture to the flour mixture and stir with a wooden spoon. Using two tablespoons or soup spoons, drop 12 spoonfuls of batter over the fruit mixture, using all of the batter. Sprinkle on the remaining tablespoon of sugar. Place in the oven and cook 20-25 minutes. After 20 minutes, insert a knife tip between two biscuits to see if they are fully cooked and no raw batter comes out on the knife. Ours took 22 minutes and were just starting to turn brown. As soon as they come out of the oven, brush the tops with the remaining two tablespoons of melted butter. Let set up five minutes then serve with vanilla ice-cream.